2018: Helped 6,000 students register vote in the Midterm Elections and made over half a million get-out-the-vote reminders. Students held “parties at the polls” on Election Day and dramatically increased youth turnout from the last midterm and work with the Secretary of State to launch the “Ballot Bowl” competition. 2018: Worked with the University of California to secure a UC commitment for 100% electricity by 2025. The announcement builds on commitments from the UC system to mitigate climate change and meet its preexisting carbon neutrality goal, and positions one of the nation’s largest public university systems as a leader on sustainability. In addition to committing UC campuses and medical centers to using 100% renewable electricity by 2025, the plan also establishes goals to reduce energy use and ensure that any major investments in buildings will not use fossil fuels after June 2019; such as natural gas for space and water heating. Over two years, CALPIRG Students worked with university staff and stakeholders and mobilized support on campus for 100% clean energy. We held events such as solar-powered concerts on campus and got thousands of students, dozens of student leaders and faculty, and student government associations to support the clean energy campaign. 2018: Passed SB100, the landmark bill for 100% clean electricity in California by 2045 to fight climate change. This comes after a concerted two-year campaign in which CALPIRG students signed on 20,000 students and 200 student group leaders across the state, brought one hundred students to lobby in Sacramento at three different climate lobby days, met with decision-makers, and got the issue covered in on and off-campus news outlets. Students worked with 6 lead Assembly Members to reach out to swing votes in the days before the vote, holding a press conference in Sacramento and organizing constituent call-in-days. 2018: Faced with new proposals for offshore drilling from the Trump administration, We’ve educated 60,000 students on the issue, generated hundreds of public comments to the Bureau of Ocean Energy Management, and organized 50 students to attend rallies across the state to stand up for our oceans. 2018: Helped ban Round Up in Santa Cruz. 2017: Convinced UC Santa Cruz to stop using neonic pesticides on campus to protect bees that pollinate our food supply, and passed a resolution in favor of banning neonics in La Jolla. 2017: Won campaign to get KFC to commit to stop serving chicken raised on medically important antibiotics by the end of 2018. 2016: Helped pass Prop 67 in CA which protected the statewide ban on plastic grocery bags. 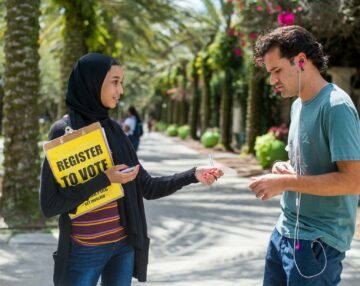 2016: Helped over 10,000 students register to vote and get out to the polls for the 2016 Presidential Election. 2016: Convinced the California Public Utilities Commission to protect solar energy. In 2015 year state’s biggest utility companies proposed to roll back progress we’ve made towards more clean energy and gut net-metering, the state’s most effective solar energy incentive. So we ran a campaign to get the CPUC to stand up to the big utilities and keep net-metering. We collected 10,000 statewide petitions and dozens of letters in support from faculty and other leaders in the community. Our Board Chair testified at the CPUC hearing and spoke at a press event on the CPUC steps. 2015: McDonalds announce in March that they are only going to use antibiotic free chicken, less than two months after CALPIRG announced our campaign targeting them and urging them to help us Save Antibiotics. Later that year, Subway announced a similar commitment after we pivoted to targeting them. 2014: Helped pass the Charge Ahead California Initiative, which will bring a million clean cars to California’s roads, replacing the number one source of global warming pollution from our streets. CALPIRG delivered 17,000 petition signatures to Governor Brown and other elected officials on this issue, as well as lobbied 57 members of the state legislature and worked to ensure that lawmakers representing campus districts heard loud and clearly that students support clean cars! 2014: Governor Brown signed into law a bill to ban plastic grocery bags statewide after we had helped to ban plastic bags in over 100 cities. 2013: Helped ban plastic grocery bags in the cities of Santa Barbara and Davis. 2012: We convinced the state legislature to approve online voter registration and worked with the Secretary of State to set up a system that would be good for students. During the election we helped over 40,000 students register to vote statewide and then had over 130,000 conversations to remind students to vote on Election Day. 2012: We delivered 12,000 petition signatures, made hundreds of phone calls and testified directly to the LA city council asking them to ban plastic grocery bags. In June, they voted unanimously to ban single-use plastic grocery bags to protect our oceans! 2010: Helped protect California’s landmark global warming pollution law by defeating Prop 23. After making more than 160,000 get-out-the-vote contacts, CALPIRG, coalition partners, and voters defeated the Dirty Energy Proposition. 2010: We helped over 31,820 students register to vote and had 170,000 conversations with students in the days leading up to Election Day to remind them to turn out to the polls. 2010: Polluters and their allies in Congress pushed for a series of proposals to block the Clean Air Act from doing its job. 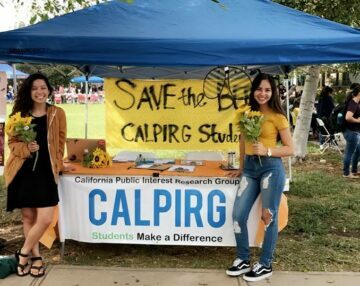 Teaming up with other student organizations around the country, CALPIRG volunteers convinced lawmakers to stop these rollbacks. 2010: We partnered with AmeriCorps to launch Energy Service Corps, to reduce energy use and take the mystery out of energy efficiency. We give people the tools and knowledge they need to stop energy from seeping out of their homes. We serve their immediate needs while also acting as the catalyst in the community to greater energy efficiency. Since 2010 we have educated over 100,000 kids about ways the can save energy. 2010: Helped protect our oceans and coasts from new offshore drilling. More than 400,000 Americans signed petitions and made calls to the Obama administration, which later announced that it will protect the coasts of the continental United States from new drilling through 2017. 2010: Helped to pass the Student Aid and Fiscal Responsibility Act, which among other things, adds $36 billion into the Pell grant program, improves the Income Based Repayment program, benefiting 1 million borrowers by capping repayment at no more than ten percent of their salary and allowing for loan forgiveness after 20 years. CALPIRG Student Chapters and Student PIRG lobbying and organizing over the past several years was critical to the passage of this historic law. 2010: Students in California joined together with thousands of students on campuses across the country through our annual Hunger Cleanup each April to raise money and volunteer in a day of service in their communities. Since students started this annual tradition in 1984, more than 150,000 have volunteered and their combined efforts have raised over $2 million. This year, in addition to service events and food drives, CALPIRG students donated funds to relief projects in Haiti. 2009: Helped pass strong legislation called, the Credit Card Accountability, Responsibility and Disclosure (CARD) Act that will end some of the worst abuses of the credit card industry, including some which are often targeted at college students. 2008: CALPIRG students played a critical role in passing Prop 1A to bring a High Speed train to California. We started with a Spring Break tour in March to build awareness of the measure and help keep it on the ballot. Right before election day, students across the state held a huge day of action that educated over 200,000 Californians about Prop 1A. We also put on Forums throughout the state, produced a Public Service Announcement, and got media coverage of the issue. 2008: CALPIRG students helped get an Affordable Textbooks provision included in the federal Higher Education Opportunity Act. The provision helps lower the cost of textbooks for millions of students by requiring publishers to disclose textbook pricing and revision information to faculty and requiring publishers to offer textbooks and supplemental materials “unbundled.” It also asks colleges to provide the list of assigned textbooks, including prices, for each course when students are registering for classes. 2008: CALPIRG students and USPIRG surveyed over 2,000 students and released a subsequent report, “The Campus Credit Card Trap,” which garnered nationwide media coverage. 2008: Students working on CALPIRG’s New Voters Project worked in a coalition to help register over 15,500 students. In the days leading up to the election we contacted over 60,000 students to remind them to vote through phone-banks, door to door outreach, including “Trick or Vote” events on Halloween and text messages. 2007: Joined the nationwide Student PIRGs’ What’s Your Plan? Campaign which talked to the presidential candidates over 100 times on the campaign trail, to ask them about their plans for global warming and higher education. 2007: We helped pass the College Cost Reduction and Access Act, the largest increase in federal student aid in 20 years. This law also made dramatic cuts in interest rates for student loans. We followed up by helping pass the Higher Education Opportunity Act, which was signed by President Bush in August 2008. That law contains several important policy changes, including an increase in the maximum authorized level of the Pell Grant to $9,000. 2006: Clean Energy Victory! 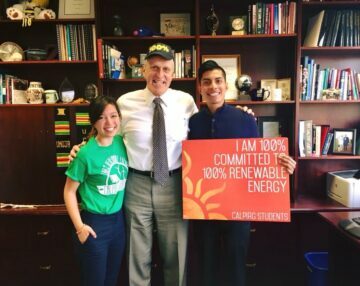 On May 26, the CALPIRG Student Chapter at University of California Santa Cruz officially won their campaign to bring 100% renewable energy to the campus. Over 70% of the student body voted to assess themselves a $3 fee per quarter to pay for any added costs of buying all of their energy from clean, renewable sources like wind and solar power. The CALPIRG Student Chapter helped to write and put the question on the student ballot, and then did aggressive outreach to encourage students to vote for the measure. Only a handful of colleges in the country currently buy all of their energy from clean sources. 2006: UC-Irvine CALPIRG students joined with ASUCI and other groups to make sure that students voted in favor of a plan to upgrade the campus buses to biodiesel and add more routes on campus. 2006: After a year long campaign by CALPIRG students in coalition with groups from across California, Governor Schwarzenegger petitioned the Bush Administration to protect all 4.4 million acres of National Forest in CA from development. CALPIRG students gathered over 1000 public comments, signed on faculty to a letter and generated media including a concert at UCSB that drew approximately 300 people. 2006: The California Public Utilities Commission approved a $3.2 billion solar program that will create a million new solar homes and businesses over the next ten years and make California the world leader in solar power. CALPIRG students played a vital role in generating thousands of comments, signing on approximately 60 faculty experts to a letter, generating media through educational events and convincing key legislators through direct advocacy. 2005-2006: CALPIRG students working with groups across campus organized different responses to Hurricane Katrina and Rita. UCSD CALPIRG students organized a trip down to the gulf over spring break for 32 students. CALPIRG students from UCSB and UCR also joined trips to the gulf. On campus, CALPIRG students organized fundraisers and educational events including Dodgeball tournament fundraisers at UCLA and UCB that raised $7,000. 2003-2006: CALPIRG released groundbreaking reports on how the textbook publishing industry is ripping-off students. CALPIRG students surveyed hundreds of professors and bookstores and our research led to approximately 400 news stories across the country. In addition, Congress called for an independent study by the GAO. After our reports, Pearson announced an online textbook that is 50% cheaper than the paperback version and the UCLA Math department negotiated a 20% cheaper Thomson Learning textbook. 2005: GAO study on textbook prices supports CALPIRG’s previous conclusions that textbook publishers’ practices are driving up the costs of textbooks. The GAO report received attention from press across the country including USA Today. 2005: CALPIRG worked in a coalition to raise $90,000 for tsunami relief efforts. 2004: CALPIRG worked in a huge coalition which included UCSA and CSSA to helped to register 40,000 students to vote. 2004: In response to CALPIRG students’ research, California passes AB2477 calling on textbook publishers to change their practices and universities to come up with ways to drive down the cost of textbooks. 2004: CALPIRG students helped to stop Congress from cutting thousands of families from low-income housing programs. 2002: In the wake of the energy crisis, we convinced legislators to adopt the California Clean Energy Law in 2002. The law—the nation’s strongest such law—requires investor-owned utilities to produce 20 percent of their electricity from clean sources by 2017. 2001: CALPIRG reporting helped show that half our national forests were rapidly disappearing due to destructive activities such as logging, road-building, and mining. This prompted CALPIRG to play an important role in convincing the Clinton Administration to move to protect 60 million acres of National Forests from such activities. CALPIRG is now working to ensure that the Bush administration implements the plan. 2001: CALPIRG’s research has consistently demonstrated the effectiveness of energy efficiency, conservation and renewable power as clean solutions to meet our energy needs. In April 2001, CALPIRG helped to write and pass a series of laws that will allocate $1 billion in urgently needed funds to conservation and renewable programs. 1999-2000: CALPIRG helped uncover serious air pollution problems stemming from heavy, diesel-running vehicles and Sports Utility Vehicles. This research and other activities helped CALPIRG and other groups successfully make the case for tough new emissions standards for diesel-burning trucks and buses, as well as to Governor Davis to preserve clean alternatives such as California’s Zero Emission Vehicle Program. 1999: A CALPIRG report documented that California’s regional water boards were grossly under-enforcing the Clean Water Act, allowing thousands of violations to occur. In response to this data, CALPIRG wrote and helped pass the Clean Water Enforcement Act, now the country’s toughest clean water law. 1999: CALPIRG led efforts to pass policies restricting the practice of charging excess ATM fees in San Francisco and Santa Monica, prompting massive national media attention and similar efforts in cities around the country. Since then, Washington Mutual has eliminated the practice. 1998: CALPIRG researchers found that over 87% of school districts widely used pesticides with chemicals linked to cancer, reproductive damage and developmental problems. As a result, CALPIRG helped to write and pass the Healthy Schools Act. The new law will provide parents with the right to know about harmful pesticides used in public schools. 1995: With assistance from AmeriCorps and the S. Mark Taper Foundation, CALPIRG volunteers and interns have removed over 100 tons of trash and debris from local waterways, replanted tens of thousands of native plants, and educated hundreds of elementary school children about local waterway issues. Between 1999 and 2001, Los Angeles area students organized over 30 river cleanups that removed over 12,000 pounds of trash from local rivers, and made over 120 elementary school presentations about water pollution.